The Bay collection designed by Doshi Levien for B&B Italia is all about materiality and exploring traditions of weaving and craftsmanship. Designers Nipa Doshi and Jonathan Levien's first collection for B&B Italia in 2014 was the Almora lounge chair inspired by the Himalayan mountains and defined by its very tactile play with materials. Continuing this design direction with the research and development team at B&B Italia, the duo have released 'Bay', an outdoor seating collection that explores the traditions of weaving and craftsmanship. "Materiality and feeling" are at the heart of studio Doshi Levien founded by Nipa Doshi and Jonathan Levien in London more than 10-years ago. Their diverse backgrounds – Nipa grew up in India and studied design at the National Institute of Design and Jonathan trained in fine cabinet making then industrial design – bring together culturally and academically rich experiences that underpin the duo's astute eye for visual culture, industrial precision, craftsmanship and materials. The Bay collection's double weave form lends transparency and lightness while emphasising the maker's hand across the design. Beginning their collaboration with B&B Italia four years ago while developing the Almora lounge chair, their newest design collection called Bay, is a series of sculptural, woven outdoor furniture pieces that continues B&B Italia's foray into weaving techniques that were first developed with the Crinoline, Ravel, Husk and Canasta collections designed by Patricia Urquiola. Bay is a range that expresses the technological, ergonomic and formal qualities of the brand’s indoor furniture. 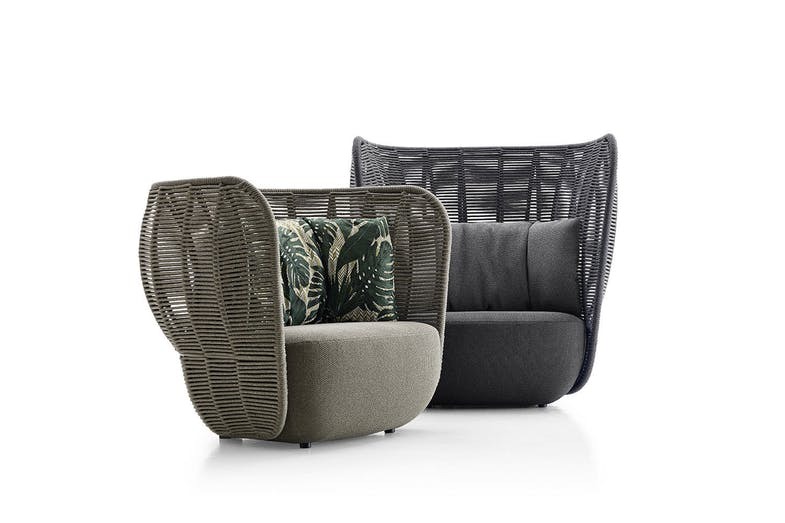 Made by weaving double polypropylene fibre, Bay combines woven volumes with boulder-like upholstered seats and soft cushions, its double weave creating pockets of air that lend transparency and lightness, while emphasising the maker's hand across each piece. The complete Bay collection includes a sofa, in two sizes, an armchair and a high-backed armchair that create a soft and sculptural approach to outdoor living. 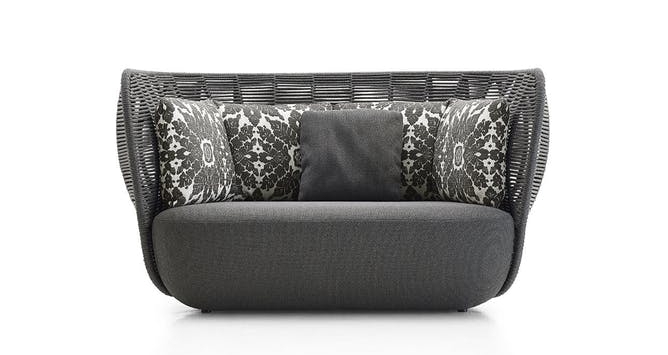 A fresh take on the colour palette includes tortora and anthracite for the weave, paired with elegant tonal and patterned fabrics for the upholstered seat and cushions. B&B Italia is available exclusively in South East Asia from Space – Australia – and Space – Asia.